With a decorated locker room, family in attendance and a pregame Senior Night celebration, senior guard Aaliyah Worley and the Stony Brook women’s basketball team were in search of a big win against the UMBC Retrievers Wednesday night at the Island Federal Credit Union Arena. However, the first half of action was anything but festive for the Seawolves. In the first half in which the Retrievers went on a 13-0 run, the atmosphere in the arena was bleak. Stony Brook struggled to retain possession, committing turnovers on four consecutive offensive drives and allowing the Retrievers to take a 27-9 lead with four minutes before halftime. The talk sparked a fire for the Seawolves to continue to chip away at the 18 point deficit, eventually making the score 41-39 by the end of the third quarter. The team would eventually take the lead and secure the 53-49 victory. With four minutes left in the game, Stony Brook responded to a Retrievers’ three-pointer through Worley, who hit a quick three of her own to make it a one-point game. Following a UMBC turnover, freshman forward India Pagan drew double coverage and passed to wide open junior guard Jerell Matthews for a three-pointer and the team’s first lead in the game. With 10 seconds left on the clock, UMBC redshirt-senior guard Brittani Burgess found her way inside the paint and looked to shoot a fadeaway jump shot to tie the game. Before she could make the shot, junior guard Shania Johnson slipped past the UMBC forwards to steal the ball and win the game. Before time expired, Johnson passed the ball to Worley as the Retrievers fouled and forced her to shoot free throws. The crowd roused in approval as they witnessed the senior connect on both shots and close her Stony Brook home career. Worley completed her final home game in style, leading the team with 13 points, going 5-5 from the charity stripe and playing all 40 minutes of the game. 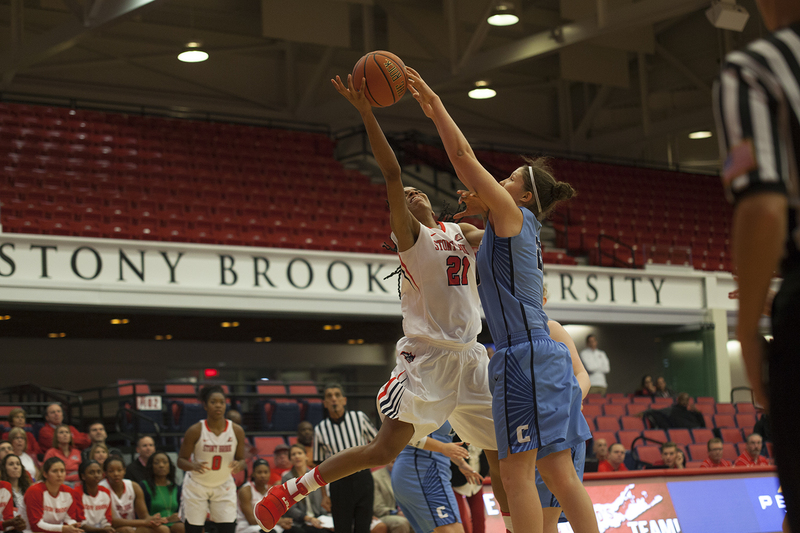 Worley reflected on her career with Stony Brook women’s basketball following the win. In addition to Worley’s production, freshman forward McKenzie Bushee contributed on both ends of the court to help erase the 18 point deficit, finishing the game with a double-double, registering 10 points and 11 rebounds. Johnson ended the game with 10 points, eight assists and five rebounds. The Seawolves will look to claim sole possession of fourth place when they take on the New Hampshire Wildcats at Lundholm Gymnasium on Saturday, Feb. 17 at 1 p.m. in conference action. Both teams are 8-6 and tied for fourth place in the America East. Saturday’s game will be the tie-breaker should the teams finish the regular season with identical records.